Hi! I’m Rachelle and I live in beautiful Southern California. I have been breeding Shih Tzu for almost 5 years and it is the most rewarding thing I’ve ever done. 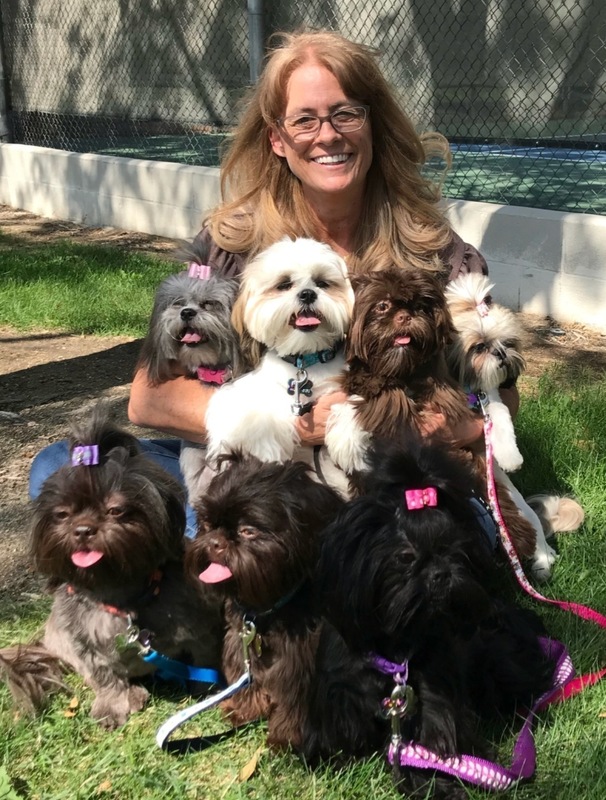 There is nothing better than the love and companionship of a Shih Tzu and I want to provide that to as many people as possible. When people buy my puppies they become part of my family. Breeding healthy, quality, beautiful puppies that meet AKC standards is my goal. All of my adults and puppies are registered with the American Kennel Club. They receive the best veteranary care, food and treats and they live inside of my home because they are part of my family. Puppies bred here are born in my living room and stay there for the next 8 weeks minimum. It is against California State Law to remove puppies from their mother prior to 8 weeks. It is also not in the best interest of the puppies or their mother. The first 2 months of a puppy's life are full of many milestones. Moms are nursing their puppies and passing their immunities on to their babies as well as teaching them important social skills and manners. While all of this is happening, I will be teaching them important things, like the word NO, and the sound that means NO and if you have chosen a name I will be calling him or her by the name you have chosen so that when you get them home they will be more responsive when called.I will also be holding them, loving on them and pre-spoiling them for you. All of my puppies and adults drink from Lixit water bottles. There are a several reasons for this; their faces stay dry which will decrease the chance of yeast growing, your floors will also be dry, water bottles deliver clean water all the time. Adults and puppies eat Purina Proplan Lamb and Rice formula dry kibble. Puppies go home eating hard kibble and are potty pad trained. I include an incredible training manual to ensure you are successful with potty training when you begin the process outside after all vaccines have been completed. The manual covers many training techniques, but I suggest focusing on the potty training and crate training sections. I send all of my puppies home with Limited AKC registration. This means that you can not show your puppy in the AKC show ring and earn points or awards and if you decide to breed the puppy later, you do not have permission to register the offspring with AKC. If you are interested in Full AKC for Showing or Breeding, please email me and tell me about yourself and your intentions. Puppies are seen by my vet prior to going home for a thorough examination and their first vaccines. They are also dewormed here by me on a 2 week schedule. 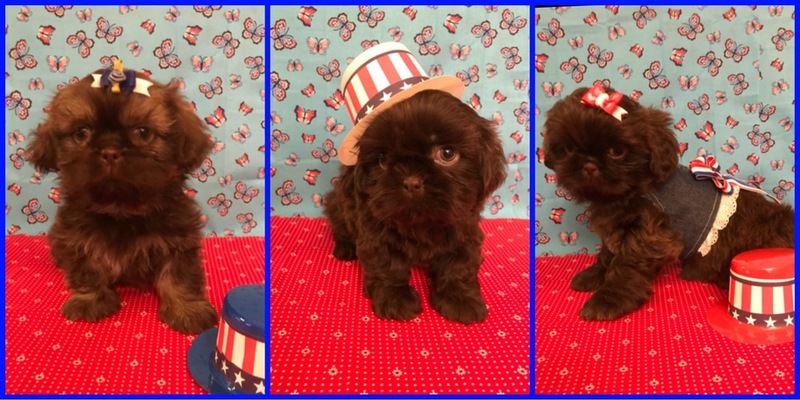 I provide a report of the veteranarian's findings and a cute vaccine record you can keep and use for the life of your shih tzu. 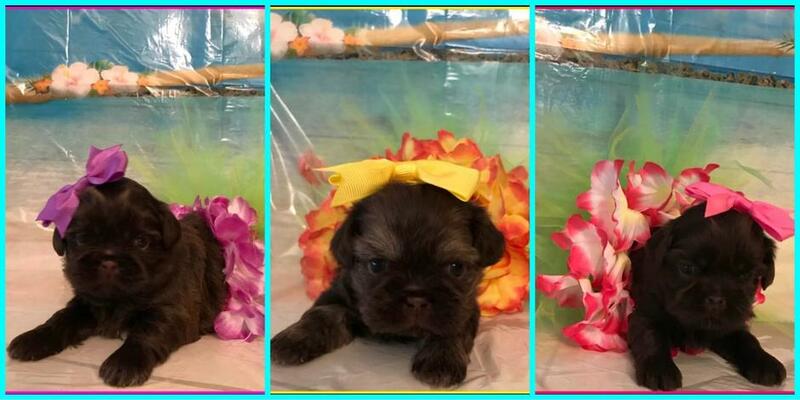 My puppies start at $1300.00 and increase in price dependant on size, color and markings. I specialize in NON FADING Liver/Chocolate, but I offer a variety of colors. I am located in Southern California, I do work with a few different pet nanny's who will gladly transport your new baby on their lap from airport to airport for an additonal fee. I encourage prospective puppy families to come visit us and meet me, the parents of puppies and the rest of my furkids. We are expecting puppies soon! Please check the Available Puppies Link for more information. 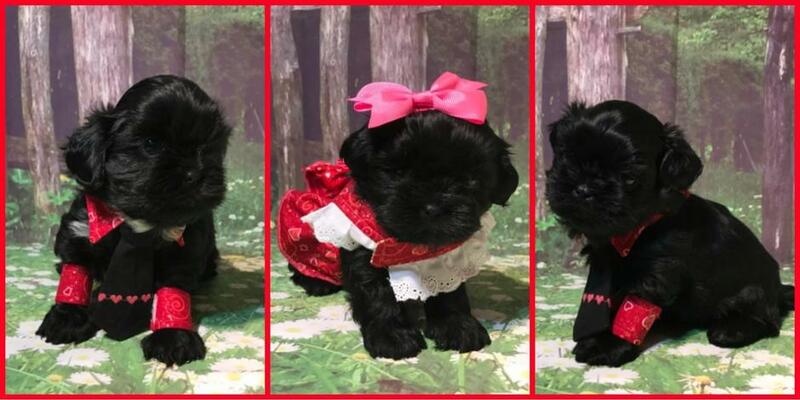 If you are interested in one of my puppies and would like more information, please email me and tell me more about yourself and what you're dreaming of. Let me make your dreams come true!